AERIAL: Flying behind woman hiking down a steep hill towards a small white lighthouse on grassy island. 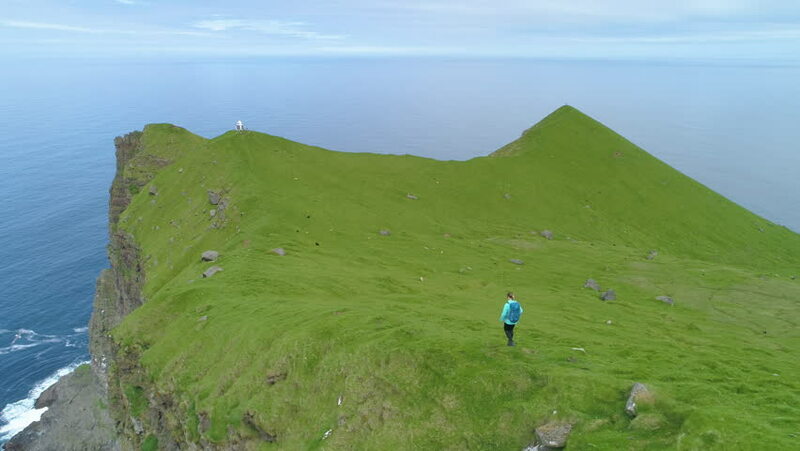 Breathtaking shot of female tourist during her descent down mountain in green Faroe Islands. 4k00:30Flying over the lighthouse Le Grand Phare, named also Phare de Goulphar, located in the island of Belle-Île-en-Mer, Morbihan, Brittany, France. It is a granite tower, designed by Augustin Fresnel. 4k00:19AERIAL: Cute little dog and active female owner hike up a narrow mountain path with a stunning view of the vast green valley. Flying above stunning mountainous nature and girl hiking with black puppy. 4k00:16SLOW MOTION, LENS FLARE, CLOSE UP: Sporty girl in flip flops skating in the park on a sunny spring day. Unrecognizable young woman casually riding her electric longboard down the scenic asphalt trail. 4k00:26SLOW MOTION SILHOUETTE LENS FLARE: Loving girl petting her horse while it grazes in the idyllic sunny pasture in peaceful countryside. Warm sunset shines on young woman bonding with her stallion. 4k00:27HALF UNDERWATER, SLOW MOTION, CLOSE UP, DOF: Unrecognizable female hiker steps into the refreshing stream on a sunny day. Unknown hiker splashing cold stream water by stepping into the glassy river. 4k00:23SLOW MOTION, AERIAL: Carefree Caucasian girl gallops on her brown horse on summer evening. Happy young woman horseback riding through the picturesque Slovenian countryside at golden lit sunrise. 4k00:16AERIAL: Unrecognizable young female tourist hiking along a scenic mountain trail in sunny Slovenia. Breathtaking view of untouched nature surrounding unknown fit girl trekking with her black dog. 4k00:14SLOW MOTION, MACRO, DOF: Unrecognizable girl's gentle hand splashing the glassy river water. Bright autumn sunlight shines on the refreshing cold lake water being scooped up by unknown young woman.